Red Hat Gluster Storage 3.3.1 delivers Red Hat Gluster Storage Web Administration. This intuitive GUI delivers monitoring and metrics capabilities with data that is derived from the Grafana platform. 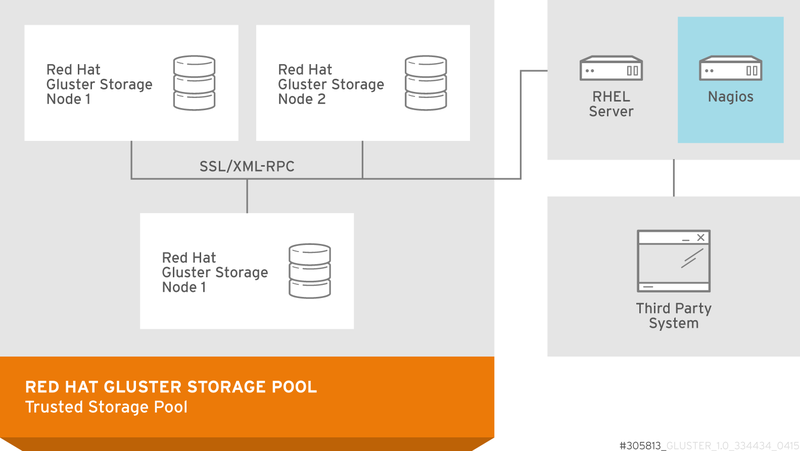 Red Hat Gluster Storage Web Administration allows you to view and customize metrics information related to cluster health, status, and performance. Event and alert notification through email is also available. Red Hat recommends using Gluster Storage Web Administration to monitor your Red Hat Gluster Storage environment. The existing Red Hat Gluster Storage Console management infrastructure is supported through the current Red Hat Gluster Storage 3.x life cycle, which ends on October 31, 2019. 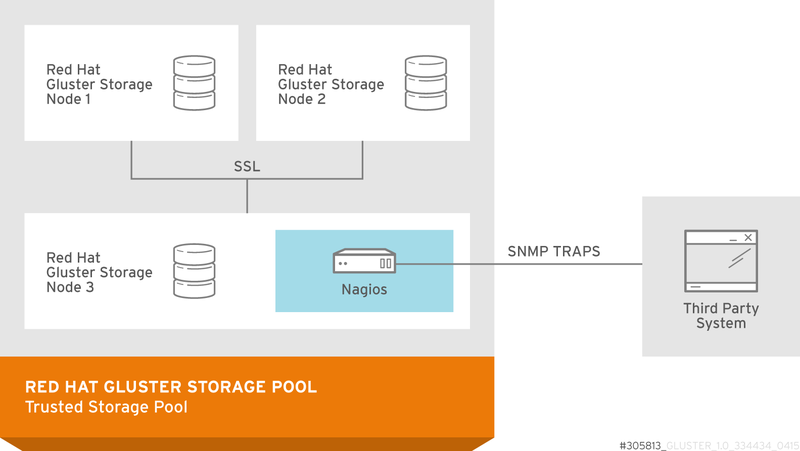 You can also monitor Red Hat Gluster Storage servers on Nagios platform to monitor Red Hat Gluster Storage trusted storage pool, hosts, volumes, and services. You can monitor utilization, status, alerts and notifications for status and utilization changes. For more information on Nagios software, refer Nagios Documentation. Using Nagios, the physical resources, logical resources, and processes (CPU, Memory, Disk, Network, Swap, cluster, volume, brick, Host, Volumes, Brick, nfs, shd, quotad, ctdb, smb, glusterd, quota, geo-replication, self-heal,and server quorum) can be monitored. You can view the utilization and status through Nagios Server GUI. Nagios deployed on Red Hat Gluster Storage node. Nagios deployed on Red Hat Gluster Storage Console node. Nagios deployed on Red Hat Enterprise Linux node. This chapter describes the procedures for deploying Nagios on Red Hat Gluster Storage node and Red Hat Enterprise Linux node. For information on deploying Nagios on Red Hat Gluster Storage Console node, see Red Hat Gluster Storage Console Administration Guide. The following diagram illustrates deployment of Nagios on Red Hat Gluster Storage node. The following diagram illustrates deployment of Nagios on Red Hat Enterprise Linux node. Ensure that you register using Subscription Manager or Red Hat Network Classic (RHN) and enable the Nagios repositories before installing the Nagios Server. Register using Red Hat Network (RHN) Classic only if you are a Red Hat Satellite user. To install Nagios on Red Hat Gluster Storage node, subscribe to rhs-nagios-3-for-rhel-6-server-rpms repository. To install Nagios on Red Hat Enterprise Linux node, subscribe to rhel-6-server-rpms, rhs-nagios-3-for-rhel-6-server-rpms repositories. To install Nagios on Red Hat Gluster Storage node based on RHEL7, subscribe to rh-gluster-3-nagios-for-rhel-7-server-rpms repository. To install Nagios on Red Hat Enterprise Linux node, subscribe to rhel-7-server-rpms, rh-gluster-3-nagios-for-rhel-7-server-rpms repositories. To install Nagios on Red Hat Gluster Storage node, subscribe to rhel-x86_64-server-6-rhs-nagios-3 channel. To install Nagios on Red Hat Gluster Storage node, subscribe to rhel-x86_64-server-7-rh-gluster-3-nagios channel. To install Nagios on Red Hat Enterprise Linux node, subscribe to rhel-x86_64-server-6, rhel-x86_64-server-6-rhs-nagios-3 channels. To install Nagios on Red Hat Enterprise Linux node, subscribe to rhel-x86_64-server-7, rhel-x86_64-server-7-rh-gluster-3-nagios channels.